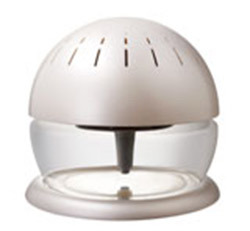 Air purifying at its best-Fight Colds, Flu and more with the Cream Snowball, Water and our Microbe Shields!You know that feeling you get when you are on top of the world? Add the Cream Snowball & our Uplifting extract to your life and you can have it every day as well as Healthier, Cleaner, Pure Perfect Air so you can breath easy and live long! Improving memory and alertness,satbilization of hormones,relief of headaches and more. With 5 color changing LED lights that can be swithched on,off or put on one color only, choose your favorite color and experiance the color therapy. Feel the benfits of the aromatherapy botanical extracts that you use in conjunction with the hydro filtration system to kill bacteria and viruses,trap impurities and leave you revitalized. Perfect For Your Home, Perfect For You, Just PerfectAire Purifiers.